[New for late 2016] I'm kind of a sucker for convenience store ice cream sales. I tend to avoid convenience store purchases in general, but if I'm there and I'm buying a pint of ice cream already, why not buy two and save myself a follow up trip to try another one of their flavors. Case in point is me finally trying this 7-Select flavor when I went to try the new pumpkin pie flavor. Nut flavored? Ok, that's different enough to get my attention. It's also been awhile since we've seen the term "revel" which is basically just a fancy way to say swirl. The caramel definitely adds some excitement to the opening shot. In fact, I took this picture while I was photographing the pumpkin flavor and the thought of the gooey swirl just kind of lingered in my brain until I gave in a tried this a few hours later. I needed to know what it tasted like. I meant to only have 3 or 4 bites but wound up having about 20% of the pint. It's not an amazing flavor, but considering that Butter Pecan was always Nick's thing and not my thing, I was a bit surprised at how much I enjoyed this. 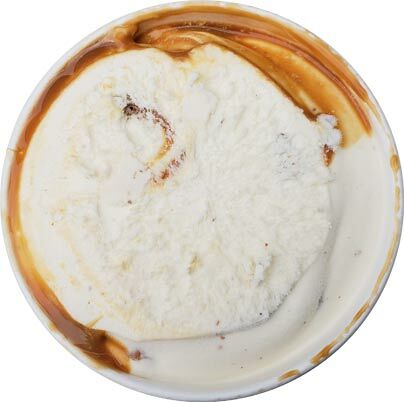 Simply put, it's that caramel swirl that hooks in a person like me. The base is very mild and really shouldn't be called "nut flavored", but when that swirl kicks in, it gets fun. 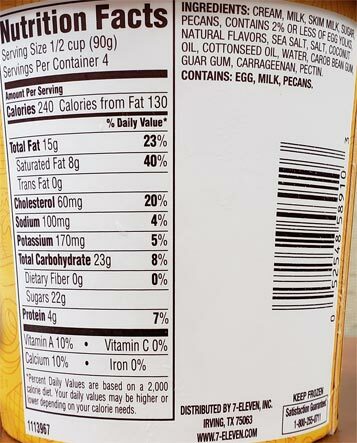 Actually, "butter pecan" might be a bit of an overstatement on the label here. Yes there are a fair number of pecans, no problem there, but I don't get a huge buttery vibe like I have on other butter pecan flavors. Fortunately for me, I prefer it that way. This one is different with the caramel swirl providing all the base flavor and then you get the flavor from the uncoated pecans mixing in. 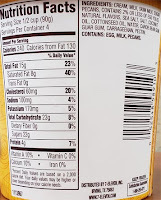 It's as if there is a certain lightness to the flavoring. It doesn't feel like a heavy flavor. It's got the sweetness to make you happy and then it's got just a bit of saltiness to encourage you to take the next bite. I like that it's not too buttery and I like that it's not too salty. Yes, those flavors linger a bit in the aftertaste, but that's to be expected. 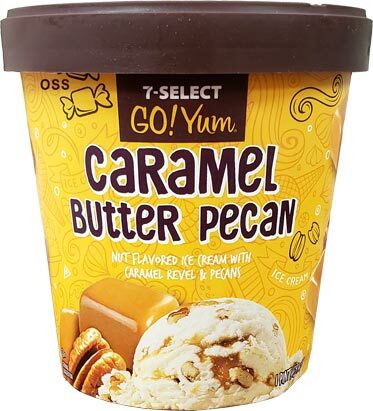 Good job by 7-11 for making old fashion butter pecan a lot more modern with the caramel swirl. On Second Scoop: I like this one even more on the second scooping. 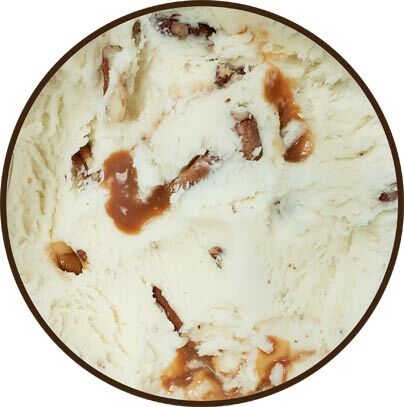 It's just nice how you can get swirl and pecans in every bite. Granted you have to aim a little in regards to getting that swirl, but I like how caramel is the dominant flavor here. I get that butter pecan fans might be disappointed if they are in it for the butter and not the pecans, but I just like this one. Different but not too different. Not too salty. Not too buttery. Did I mention there are plenty of pecans? Technically it's made in a plant owned by Wells Dairy (aka Blue Bunny). Unfortunately it's meant to be a super premium alternative to the Blue Bunny stuff you find in the freezer aisle nowadays.